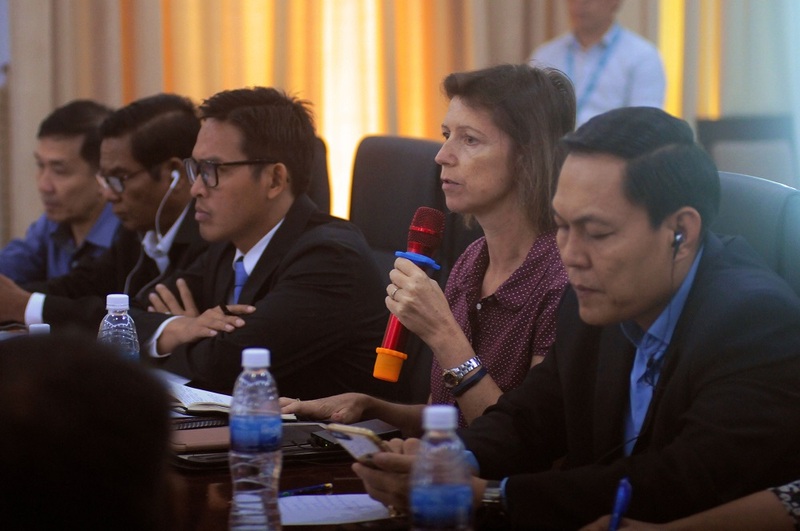 Prior to the launch, expert teams were formed and assigned to three provinces – Kratie, Kandal and Battambang. Teams consisted of Government officials from various ministries and UNICEF staff who have been deeply involved in the programmes implementation. In each region, teams met with local authorities and NGO partners to assess programmes’ status and learn about potential challenges and rooms for improvement over the course of three days. In informal meetings, community leaders, teachers, parents, children and other stakeholders shared their experiences with the programmes and provided valuable feedback. As a starting point, all participants gathered at a factory in Phnom Penh owned by Vissot Co. Ltd., a company that launched its first ready-to-use therapeutic food called Num Trey (link to article) with support from UNICEF and partners. The fish-based snack was developed to combat acute severe malnutrition among children and women in Cambodia. At the site, participants followed the production process and tasted the final product. Afterwards, the group split into teams to travel independently to the assigned province. This year’s sites included primary schools, family-based care institutions, health centres, urban poor and hard-to-reach communities with a strong focus on education, child protection, health, nutrition, community development and WASH (water, sanitation and hygiene). In primary schools, implementing positive discipline and parenting, ensuring inclusive education for children with disabilities, and the provision of clean WASH facilities were the most urgent priorities. A clean and safe environment for all children is pivotal for them to thrive, therefore, schools were equipped with new WASH facilities with additional ramps for children with disabilities. To make education accessible for all children in Cambodia; RGC, UNICEF and NGO partners developed a training programme for teachers to educate children with disabilities. All trainings are designed to break down stigmata against children with disabilities on a communal level and encourage parents to enroll their children in school. As part of RGC and UNICEF’s commitment to end violence against children positive discipline and positive parenting training was implemented to schools. Both go hand in hand and provide teachers and parents with a toolkit of non-violent strategies to educate and raise children. Other teams followed up on children’s transition from residential care institutions into family-based care based on the National Action Plan for childcare improvement. So far, many children were successfully reunited with their families or placed in the hands of loving foster parents. To guarantee access to health services, visits to Health Centres were also a crucial part of this year’s outing. At the centres, participants talked to nurses and doctors about the services quality and potential challenges due to limited infrastructure. Lastly, parties traveled to Urban poor communities to discuss with local authorities urgent needs within the community. In private conversations with residents, team members learned about the hardships of peoples’ lives resulting from electricity and water supply shortages. On the fourth and last day, all teams reassembled in Kampong Cham to discuss and analyze the findings of each region as a basis for future calls for action. All recommendations will be included into the annual review and form the basis for upcoming planning meetings. In the end, participants agreed that annual visits are indispensable for the programmes development and therefore must be continued in the future. Additionally, more financial resources are needed to ensure the programmes sustainability. In her closing remarks, UNICEF Deputy Representative, Natasha Paddison, thanked everybody for their deep involvement and emphasized how this visit greatly strengthened the partners bond and commitment to create a brighter future for children and women in Cambodia.